Simply Sensational Sweet and Chewy Coconut Macaroon Cookies! 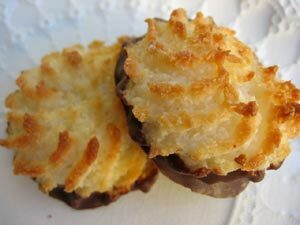 I love Coconut Macaroons and these homemade macaroon cookies are an all time favorite. With only five ingredients, this super easy cookie recipe for homemade macaroon cookies is both convenient and delicious! These simple, sweet, chewy, macaroons are perfect if you are a fan of coconut. It's one of those coconut cookie recipes that's versatile too. If you like the flavor of almonds, feel free to add a little almond extract. Or if chocolate and coconut are more your style, you can dip your macaroons in melted chocolate. One of the fun parts of homemade baking is tweaking recipes to make them your own. I've included several coconut macaroon recipe variations that you may want to consider. Adjust your oven racks so one is in the center of the oven. Preheat the oven to 325F degrees. Line cookie sheets with parchment paper or silicone liners. In a large bowl, combine the coconut, condensed milk, and vanilla until well blended. In a medium bowl, beat the egg whites and salt on high speed with an electric mixer until stiff peaks form. Gently stir/fold the egg whites into the coconut mixture, being careful not to deflate the egg whites. Drop the batter onto lined cookie sheets with either two teaspoons or a 1 3/4-inch diameter ice cream scoop 2-inches apart. Bake for 22 to 28 minutes, or until golden brown. Remove from the oven and let cool for a few minutes then transfer the cookies to a wire rack with a thin metal spatula to cool completely. This recipe yields between 2 and 3 dozen Coconut Macaroon Cookies. Almond Coconut Macaroon Cookies: Add 1/2 teaspoon almond extract with the vanilla. Chocolate Chip Macaroons: Stir in 1 cup mini chocolate chips with the coconut and sweetened condensed milk. Chocolate Coconut Macaroon Cookies: Melt 12 ounces chocolate with 2 tablespoons shortening. Stir to combine and then dip the cooled cookies in the melted chocolate mixture and let cool. Chocolate Macadamia Macaroon Cookies: Follow the directions for the Chocolate Topped Macaroons and then sprinkle with chopped macadamia nuts while the chocolate is still warm. Cornflake Macaroon Cookies: Decrease coconut to 1 cup. Stir in 1/2 cup chopped nuts, and 1 1/2 cups cornflakes to the sweetened condensed milk mixture. Aunt Eve's Macaroons: Decrease coconut to 1 cup. Stir in 1/4 teaspoon almond extract, 1/2 cup cornflakes, and 1 cup chocolate chips with the coconut and sweetened condensed milk. Preheat the oven to 350F degrees. Line cookie sheets with parchment paper or silicone liners. In a large bowl, beat the egg whites and vanilla until soft peaks form. In another large bowl, sift together flour, sugar and salt. Fold in beaten egg whites, then fold in coconut, mixing thoroughly. Drop the cookie dough by rounded teaspoonfuls onto lined cookie sheets about 2 inches apart. Remove from the oven and immediately transfer the cookies to a wire rack to cool completely. This recipe yields between 2 1/2 dozen Golden Coconut Macaroon Cookies. Cherry Coconut Macaroon Cookies: Add 1/2 cup chopped candied cherries along with the coconut. Chocolate Chip Macaroons: Substitute 1/2 cup chocolate chips for the coconut. 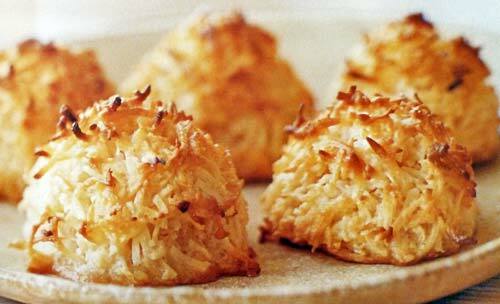 Cornflake Macaroons: Substitute 2 cups cornflakes for the coconut. Hazelnut Macaroon Cookies: Substitute 2 cups finely ground hazelnuts for the coconut. One of the keys to making light and moist, chewy coconut macaroons is first to stir the batter to separate and distribute the shreds of coconut, then beat the egg whites to soft peaks and fold them gently ino the dough. Position a rack in the middle of the oven and preheat to 325F degrees. Line cookie sheets with parchment paper and butter the paper. In a large bowl, using a fork, stir together the coconut, condensed milk, salt and vanilla and almond extracts until well blended; set aside. In another large bowl, combine the egg whites and cream of tartar. Using an electric mixer on medium speed, beat for about 1 minute until the egg whites are foamy. Increase the speed to medium-high and continue beating until the egg whites look shiny and smooth and form soft peaks, about 2 to 3 minutes. Slowly add the sugar and beat until stiff peaks form in the egg whites, about 1 minute longer. Using a rubber spatula, in 2 batches, gently fold the egg whites into the coconut mixture until no white streaks remain. Drop rounded tablespoonfuls of the dough about 1 1/2 inches apart on the prepared sheets. Bake, 1 sheet at a time, until the cookie edges and some tips of the coconut shreds are lightly browned, about 15-17 minutes. Let cookies cool on the sheets for about 5 minutes, then transfer to wire racks and cool completely. Store your macaroon cookies in an airtight container at room temperature for up to 3 days. This recipe makes about 36 Chewy Coconut Macaroon Cookies. Five simple ingredients combine perfectly in these rich and golden coconut cookies. Preheat oven to 350F degrees. Line cookie sheets with parchment paper or use nonstick pans. In a mixing bowl with an electric mixer, beat the egg until light. Gradually beat in the sugar, vanilla and orange zest and continue beating until light and fluffy. Drop heaping teaspoonfuls of dough about 1 1/2 inches apart on the prepared sheets. Turn off the heat and let the cookies dry in the oven for 10 minutes longer. The insides of the cookies should still be soft while the outer surface is crispy. Transfer macaroons to wire racks and cool completely. Store your cookies in an airtight container at room temperature for up to 1 week. This recipe makes about 36 Chewy Coconut Orange Macaroon Cookies. Did you know that during the Great Depression coconut was considered to be a luxury item and the macaroon recipes of that era often preserved this precious ingredient by either replacing or combining it with cereal, such as corn flakes. Luckily today, coconut is much more affordable and you can easily make these coconut macaroons at home with real coconut. Preheat oven to 325F degrees. Line cookie sheets with parchment paper or lighlty grease and flour sheets. In a mixing bowl combine coconut, sugar, flour and salt. Stir in egg whites and almond extract. Drop heaping teaspoonfuls of coconut mixture about 2 inches apart onto prepared sheets. Bake for 20 to 25 minutes or until edges are golden. Transfer cookies to wire racks and cool completely. In a small saucepan, combine chocolate chips and shortening and stir constantly over low heat until melted. Drizzle melted chocolate over cooled macaroon cookies. 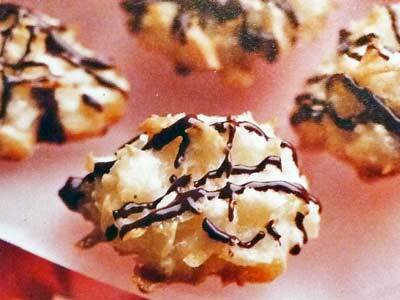 This recipe makes about 30 Chocolate Drizzled Coconut Macaroon Cookies. Preheat oven to 325F degrees. Line cookie sheets with parchment paper or silicone liners. In a large mixing bowl stir together coconut, sugar, flour and salt. Stir in egg whites and almond extract until well blended. Drop teaspoonfuls of cookie mixture about 2 inches apart onto prepared sheets. If desired, press 1 whole almond into center of each cookie. Bake for 20 minutes or until cookie edges are golden brown. This recipe makes about 3 dozen One-Bowl Coconut Macaroons.